A perfect choice for a dog that wants something more than just a collar. Two-coloured material and a large stylish D- ring for leash attachment give the collar a trendy look. 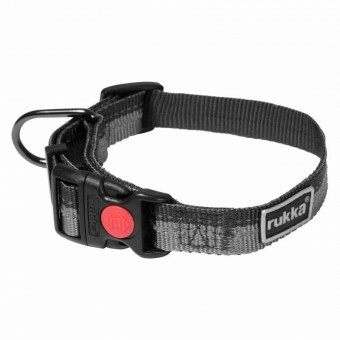 The lightweight collar is adjustable in size. The tensile strength of the collar is enhanced by an easy fast-opening buckle closure with a safety lock. A special attachment mechanism to take the pressure away from the buckle and to add safety. There is a stylish gunmetal finish on all metal parts. The machine-washable collar has reflective stitching and logo.